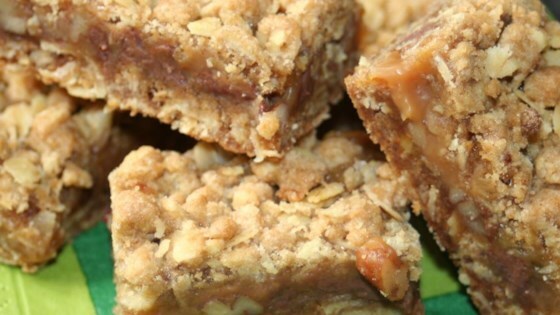 "Yummy oat bars filled with a gooey layer of caramel, chocolate and nuts! " Preheat oven to 350 degrees F (175 degrees C). In a medium saucepan over low heat, melt together the caramels and heavy cream, stirring occasionally until smooth. In a medium bowl, stir together the flour, oats, brown sugar, baking soda and salt. Stir in the melted butter until well blended. Press Half of the mixture into the bottom of a 9x13 inch baking pan. Reserve the rest. Bake the crust for 8 minutes in the preheated oven. Remove and sprinkle with chocolate chips and walnuts. Pour the caramel mixture over the top and then crumble the remaining crust mixture over everything. Return to the oven and bake for an additional 12 minutes, or until the top is lightly toasted. Cut into squares while it is still warm. The sweet secret is creamy caramel chips! Too sweet. Way to much butter way too rich. Kraft now makes a bag full of pea sized caramel bits which work great for this recipe, rather than unwrapping the squares..